There's thirty-four years of Jedi mind tricks telling us that the highly suggestible are, well, weak-minded. 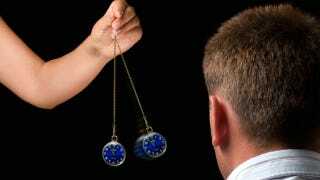 But now new research suggests the easily hypnotized actually have some unusual mental powers. Specifically, they can hallucinate any color they want — whenever they want. That's the finding from a new study at the University of Hull in the U.K. Psychologists gathered together two groups - one of whom said they were "highly suggestible" in hypnosis and another group that said they were not easily hypnotized. The groups were shown some black-and-white patterns and asked to try to see colors in them. The highly suggestible group was consistently able to see colors, but under hypnosis and of their own free will, while the second group generally failed at this task. Now, that might not sound all that impressive. After all, all the group did was show they were able to see things that weren't actually there. But according to the psychologists, they were able to measure some extraordinary brain activity in the highly suggestible group. These subjects showed significant changes in the parts of their brains responsible for visual perception, and they essentially did it through sheer force of will. Contrary to its depictions in pop culture, hypnosis is a totally voluntary phenomenon, and those who allow themselves to be hypnotized can become extremely suggestible and relaxed, as well as experience heightened imagination. Previous research had shown hypnosis was able to make people see colors that weren't there, but this new research indicates that the hypnosis simply unlocks an ability in certain people that was actually there all along. "These are very talented people. They can change their perception and experience of the world in ways that the rest of us cannot." Via Consciousness and Cognition. Image by Sinisa Botas on Shutterstock.